The sofa is a piece of furniture that can enhance or diminish the design and area size of your living room. That is why when you decide to buy one, you should make sure that it matches your home’s interior design and can fit perfectly. Hence, it is highly recommended that you buy the best sectional sofa. Before sectionals were popular, sofa sets were the norm in every household, but now, they have become a staple in almost every home, and it seems as if the trend is here to stay. So, if you don’t have one yet, it is about time you get one. But what makes one the best and how do you decide whether or not a sectional is ideal for your space? Before going super crazy, you should measure the room you plan to house your sectional in since sectionals can sometimes overwhelm the space that they occupy. Though a sectional sofa acts as a space saver, sometimes, it can be a bit too much. It is, therefore, important that you are certain that a sectional is the right piece of seating furniture for your space. Below, you will find three sectional sofas that might be a good addition to your living room. We have looked into their features, pros, and cons. A sleek profile and metal legs make this piece an eye-catching modern addition to your home. Stain-resistant, heavy-duty fabric is woven for a velvety look and feel, yet designed to outlast many movie nights and quiet lounging days. This 96 x 35 x 34 inches and 206 pounds sectional sofa is available for purchase in navy, ecru, and pewter shades. It is upholstered with a heavy duty fabric that is resistant to stain. In addition, it gives the product a velvety and contemporary look. This product has a hardwood frame that is supported by eight metal legs, giving it a maximum weight capacity of 800 pounds. What is more interesting is that it has reversible cushions and removable covers. Upon purchase, you are given 30 days to return the product in case there are problems. Likewise, it also comes with a 12-month warranty deal. On another note, if you think a sectional would be too big for your space or you need to add more items since this is not enough for your large room, then you can choose from a sofa, living room chair or ottoman from the same product line. Ultra modern styling. The sofa's design is designated to Stendmar only. It is not available through any other sellers. 3pc includes: Left Sofa + Right Chaise + Ottoman in Dark Grey microfiber finish. Solid wood-frame with high density 2.8 foam seat cushions. Black wood legs. Due to the size of shipment, we only offer shipping through common carrier trucking services. Shipping rates vary according to delivery location. Transit time is an estimated date only. Common carrier will contact customer prior to set up delivery time/date before delivery is attempted. items will take 5-15 business days to be delivered depending on ship to location. Curbside delivery only; no set up and no move in. 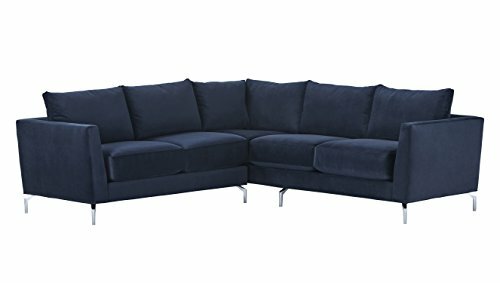 This sofa set is unique to Stendmar only and may be the best sectional sofa on this list. It was crafted by a team of skilled craftsmen with years of industry experience. It comes in dark gray color, and a weight of 300 pounds, so you will require some assistance to get it into your favorite space. Since this is a set, it comes with three pieces namely the sofa, chaise and ottoman. It has a solid wooden frame and wooden legs that have black colors. The foam cushioning has a high density and has been covered or upholstered with microfiber fabric. Lastly, this comes with matching pillows and can be converted into a bed. This two-piece sectional sofa has tufted accents and comes with three toss pillows that have geometric patterns. You can purchase it in a rich chocolate brown or a classy grey color. As for the size, it has a total size dimension of 84 x 107 x 35 inches and weighs nearly 191 pounds. This product has a frame made of plywood that is strong enough to accommodate a total weight of 900 pounds. The backrest, seat, and armrests have a coil spring and foam cushion that is attached to the frame securely. To add, this product is upholstered in 100% polyester and can be cleaned using detergents, dry cleaning solvents or upholstery shampoo. As for its legs, it is made of a hollow plastic material. The three sectional sofas we have reviewed about all have designs and colors that will work for both modern and rustic homes. All of them can also accommodate multiple numbers of individuals comfortably. However, choosing one may be easier if your concern is budget. You might think that it would be better for you to just gravitate to the cheapest, but paying a lower cost doesn’t necessarily mean that you will get a quality product. The Rivet Emerly Sectional Set is the most expensive amongst the three, but it comes with free shipping and has durable legs. However, the cushion may be too stiff and require that you break it in before your body gets used to it. It also does not come with additional useful items like an ottoman or toss pillows. Nevertheless, you can purchase them separately. 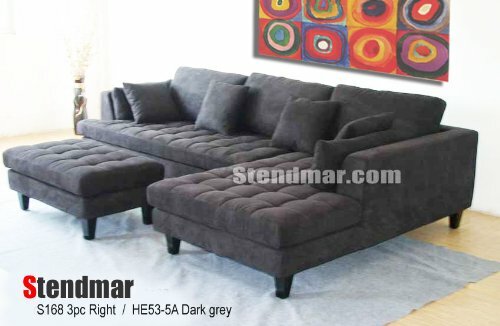 On the other hand, the Stendmar Sectional Sofa has a mid-range price and can be used as a bed and sala set. Also, Stendmar is also willing to customize some aspects of the product for you. However, there is a hefty cost attached to the shipment as it is too heavy. The Homelegance Sofa is the most affordable on the list. This and the one from Rivet Emily has been designed and constructed in a way that they can fit in the corners of the house, which can obviously save you more space. Nonetheless, by purchasing it, you get what you pay for, which is a sectional sofa that isn’t necessarily of high quality compared to other brands. With that said, either the Rivet Emerly or Stendmar sectionals would be a good choice since you get more with the purchase, making them cost-efficient.